A new website has been posted that organizes Common Core evidences into one location and included a petition with several components to get us off Common Core and related components. The site is the work of many organizations who understand the threat presented by the entanglements the components of Common Core get us into. Please check it out by visiting www.UtahnsAgainstCommonCore.com. Did Utah Leaders Even Read the CC Contract? Thank heavens for citizens like these. If our Governor and state education leaders don’t have people reading contracts and understanding the implications, they most certainly need replaced.Please share this document on Facebook and with state delegates so they understand why we need to elect leaders who will understand that Common Core (ObamaCore) is just as bad for Utah as ObamaCare. Check out what the CATO Institute just published called, “The Other Federal Takeover” relating to Common Core. Thank you for having Alisa Ellis, Renee Braddy, Kevin Braddy and me, as Heber City citizens concerned about Common Core, to your office on Wednesday. It is clear from the document that the federal government has trampled G.E.P.A. laws as well as the 9th and 10th Amendments to the Constitution, by asserting authority, and without authority of law but via grant money and the dictates of Arne Duncan, to set terms upon Utah and the SBAC, including requiring ongoing assessment status reporting, telephone conferencing, responses to requests from the U.S. DOE for information, written updates, and mandating that “across consortia” the testing methods and data collected from the tests will be coordinated. This triangulates information and creates centralized data collection not only of math and reading scores, but of personally identifiable and unique student information. I am sure the citizens of Utah would not vote for that. It slipped under the radar, like so many other aspects of the Common Core initiative, because it was never brought under public or legislative scrutiny. Superintendent Shumway, the State School Board, and the Governor, signed the documents that have bound us to this loss of sovereignty. No one else knew it was happening. I respectfully request that your legal team contact the U.S.O.E.’s legal team as soon as possible to discuss the educational sovereignty of our state and the financial obligations under which we will be burdened by remaining legally bound under CC and SBAC. Have them read the Race to the Top Applications one and two; have them read the Cooperative Agreement between U.S. DOE and SBAC; have them read the WestEd Letter, which is in the binder of information we left with you, which is also in the possession of Carol Lear. That will be a good enough start to make it clear that these are not the assertions of fearful people but facts that actually bind Utah to sobering Federal controls. I have been counseling with Jim Stergios of the Pioneer Institute, a non-federally funded Massachusetts think tank. I asked him this: if Utah were to pull out of Common Core and the SBAC, would the consortium have to return any of Utah’s portion of the consortium’s assessment development money and other rewards, incentives and waivers to the Federal Government? Stergios called this question a good one, because it shows how confused and confusing the federal role has gotten on Race to the Top, the money, and commitments. He said that if states have done what they promised they would do with the Race to the Top money received, then once it is spent there is no hook for the federal government to enforce reimbursement to the feds. If the money flowed to those purposes, the state cannot be forced to return money for a change in policy on standards. However, if states adopt the Common Core/ SBAC tests (both of which Utah has done) or accept a federal waiver from No Child Left Behind (which Utah has applied for) there is a problem of irreversibility. He said that states that have not adopted the CCSS have come under much heightened scrutiny by the federal government and also pressure from some foundations. But he told me, too, that once the national tests are adopted, which happens in 2014, it will become incredibly hard to pull back out. If Utah or any state accepts an NCLB waiver, which comes with the requirement that states adopt national standards, pulling out will lead potentially to federal oversight of a vast number of districts in one’s state. Please have your lawyers look into these questions of irreversibility that Jim Stergios raised. 1) The Common Core Initiative has taken great pains to repeatedly claim that this movement has nothing to do with federal controls, is not a federal initiative, and is state-led. This they claim despite the fact that they funded the whole movement, from funding the NGA and CCSSO, the groups who “started” it, funding the developer of the common standards and curriculum itself, Achieve,Inc., and funding the grants associated with the movement, notably ARRA-based Race To The Top. Even the letter itself uses the words “not a federal initiative.” Arne Duncan chooses his words very deliberately. Because he paid the NGO and CCSSO to do what he was not legally authorized to do, he can truthfully say the feds did not initiate this movement. But they funded and directed it from the beginning and continue to do so. There is a difference between the phrase “federal initiative” and the phrase “federal control”. That is a very significant choice of words. 2) Secondly, the fact that Arne Duncan, not a group of state governors, clarifies policy, sends letters like this to you and to Superintendent Shumway, and sets the terms of cooperative agreements, reveals the fact that the U.S. Department of Education, not the NGA or CCSSO, is in control of and behind this initiative. Otherwise, state leaders would be directing their questions about Common Core, and getting answers about Common Core, from the NGA and the CCSSO, the “state-led” leaders of this movement. Joining the Common Core Initiative would make sense to some in Utah if we had received educational funding for our memberships in these movements. We got no money for our agreeing to sign up for these memberships in CC and SBAC. As for me, I don’t believe it befits states to participate in federal grant lotteries, even if there were no manipulative “points for joining” strings attached. Race to the Top amounted to not only a federal grant lottery but also a sneaky way for agenda-pushers to slide Common Core under the general public’s nose without drawing attention to itself. Remember, Utah received nothing by joining Common Core. All academic values in Common Core are in the public domain and we could have used our sovereign state educational system to adopt any of them that we liked, if they were proven –which they have not yet been– to be superior, in all areas, to what we had before or to what we would aspire to create. We look forward to meeting with you, Superintendent Shumway and your legal team together again next month. I have obtained a copy of Utah’s Race to the Top application. In searching the 493 page document the below items appear which evidence directly contradicts the information put out by the Utah State Office of Education which has maintained that Utah is not obligated to anything. Clearly we are. In fact, if Utah was applying for a federal grant (Race to the Top), why are we obligating ourselves in the application for funds, to sign on to Common Core State Standards and assessments created by a non-government entity (SBAC)? The federal government is simply corralling everyone into these programs to make it easier to nationalize education. Another “sign on the line” lottery so we can spend millions of dollars changing out our standards and assessments in a vain attempt to get federal grant money. Shameful. If you would like to download a copy of the application, it will be available at this link for 7 days. It is a 40 meg pdf file. Here are some of the low-lights found in the document. In other words, we are required to implement standards, assessments, and abide by the decisions that other states determine. We are also required to find the barriers in state law that might prevent this takeover of education and try to eliminate them. Pg. 297 THE GOOD NEWS!!! Governor Gary Herbert signs on the line obligating Utah to all these requirements. Utah is bound thanks to the Governor not understanding what he was obligating Utah to do. On March 6th, talk radio host Rod Arquette interviewed State Superintendent Larry Shumway and Alpine School District Board member Wendy Hart (speaking for herself and not the board) on the subject of Common Core. The interview took place just a few days after Sup. Shumway had written a letter to Secretary of Education Arne Duncan, as well as a letter to the Senate education standing committee. You can read the Superintendent’s letters by clicking those links. Here are links to download the show portions dealing with Common Core (Shumway, Hart, and a few callers). Rod: How about the letter itself, Superintendent. Why do you think it was important to write? Larry: Well, I thought that there were enough people being concerned about the Federal Government’s intrusion into the [Common] Core Standards in Utah that I should make clear where we stood. I wanted to push back on comments that I’ve heard Secretary [of Education] Duncan make and President Obama make about their participation in the [Common] Core. These standards are our standards. We’ve adopted these in our states, and we control them. Rod: You said you were disappointed. What did they do to create that disappointment you have? Are they trying to inch in on this a little bit? Larry: Well, I’m bothered by things I hear the secretary say in speeches and the President say in speeches where they take credit for these standards. And I’m bothered by the Department of Education making requirements that are associated with these standards. They’re not their standards, and so that offends my sensibility and it pushes against our states’ rights of sovereignty in public education. I applaud State Superintendent Larry Shumway for asserting our state rights to Secretary of Education Arne Duncan, however, it is quite obvious to everyone that takes the time to look into the facts that the federal government’s involvement is just getting warmed up. Why is it that educators hated NCLB and the strings attached, but they are excited about getting RTTT money and the strings attached to it (namely adopting Common Core)? When have the feds ever had an altruistic program of giving out money (our own money) without requirements that cost more money than they were giving out? Utah, it’s time to wake up to what’s happening, or as this Washington Times article points out, “states are likely to become little more than administrative agents for a nationalized K-12 program of instruction”. You should read part 1 and part 2 before reading this installment. This is the last exchange of emails with Dixie Allen on the state school board. I think now I have provided everyone with both sides of the story so you can understand the State Board and USOE position better. Again, I strongly encourage you all to do your own research. You don’t need to believe what I’m posting. Many people helped put the timeline and links together on our Common Core page and I encourage you to look at the links and do your own homework and ask yourself if you want the state of Utah to be involved in Common Core. If not, you really ought to consider running for school board, state school board, or legislature to influence these things. The deadline is Thursday March 15. Decisions are being made that will impact your children and grandchildren. Most of the information you have listed below, we did know. However much of your concern comes from your lack of the perspective of those working in the system and trying to make a reasonable move to better standards, but with no money or help from our legislature to work to improve our standards. We were well aware of the improvements of Massachusetts and a few other states, but we did not have the money to evaluate and upgrade the standards to the degree necessary. So when the Governor’s and Chief School Officers Associations started looking into a quality upgrade for common standards to help our students score better on national and international testing, it was the next important step for our state to move forward. In answer to who evaluated the Common Core Standards for out state, you need to know that specialists at the State Office of Education, State Board Members, District Curriculum Directors, Teachers, specialists and our partners in the K-16 Alliance. It is believed that the Governor’s Office also checked out the standards, as they signed off on them and added their support. Your quotes from professors and others are interesting, but they were not part of any information we saw as we adopted the Common Core Standards, a year and a half ago. I am not sure I disagree with their take on the Standards, however, we see these standards as a stepping stone to move our students closer to the best standards possible. If you could listen to how hard our districts, administrators, teachers, parents and students are working to raise the bar high enough to meet the expectation of these standards, you would realize it will take some time to move our state to an ultimate level of curriculum standards. As I stated before, we did know that the Gates Foundation had help fund the standards. The Gates Foundation have funded many new programs in the educational arena and did not appear to me to be contributors with a specific agenda. We knew that money was given to pull these standards together — money we did not have to do such work on our own. Finally, I don’t believe you still understand that regardless of the reasons that Debra made her statement — your reaction and email was accusatory and not that of someone who wanted to better understand the issue and help move our work forward to the best possible quality standards. Your email was accusatory and uninformed as to what work we have put into this issue and the agendas we have been hearing from the “far right” which Debra was attempting to address. Bottom line, we have worked for about four years to move our standards to a higher level to improve our student’s ability to be ready for college and/or careers. It would be nice if interested individuals like you would help us take this step and then take more if needed when it is appropriate. Dixie, thank you for clarifying that the board knew the connections with the Gates Foundation but was unaware of the agenda. With this important new knowledge that the public has brought to you, what specific actions will the board now take? Clearly this is game changing. I find it interesting that you say the legislature wouldn’t help to improve the standards when in fact it was the legislature that forced the state to improve the math standards back in 2007-08. The USOE didn’t want to do it. The USOE also reviews and modifies standards every few years so your argument doesn’t make sense to me. If the legislature wasn’t funding the raising of the standards, then why would the state adopt Common Core standards without a commitment of money from the legislature? If you knew MA was making improvements to their standards, why not ask a standards writer like Dr. Milgram or Dr. Hu, who both helped us before, to make a recommendation for a small sum of money rather than say we couldn’t afford it? Who made the decision then to adopt Common Core if nobody could be paid to review them? I cannot fathom a circumstance where the legislature wouldn’t have supported a move to top of the line standards, especially when they now have to fund Common Core. You indicate below that you didn’t see these quotes critical of the Common Core back when you adopted the core and quite frankly, that doesn’t surprise me. These standards were approved before there was even a final version for anyone to review. It was breathtaking to those of us who had to battle the USOE to raise standards just a few short years ago to have these brand new standards sail through so fast. Did you know that before the Fordham Foundation rated them an A- (the same as Utah’s math standards), that the Gates Foundation paid Fordham a sizeable sum of money (ie. bribe)? Did you know that the Fordham Foundation actually said that between Utah’s math standards and the Common Core it was “too close to call” as to which was superior? If the state board is truly concerned with raising the bar, why didn’t we adopt California’s math standards which Fordham listed as “clearly superior” to the Common Core? It leaves the public wondering what the real thought process is at the state level because on a common-sense level, this makes no sense spending millions of dollars for a lateral shift (unless of course RTTT funds were tied to adopting Common Core in which case it’s perfectly logical that the state wanted to pull the slot machine handle in the hopes of getting a federal jackpot). You indicated in a prior email that Debra’s comment was not talking about people like me but about those who thought these standards were too hard. However, in this reply you indicate that Debra was in fact talking about people from the “far right”. In that case, I’m quite certain most everyone on this email considers myself, Eagle Forum, and other parents part of the “far right.” So it would appear that my “accusatory” email to Debra was exactly on target with what you are now portraying. Her comment fanned the flames that “right wing” people don’t really care about education and in this case don’t want our children to have career and college ready standards. That was completely uncalled for and that’s why I wrote. I happen to like Debra and most of the members of the board that I’ve been able to speak to, but accusing me of not getting both sides of the story before assuming what Debra meant seems now to be completely baseless. In fact, I’d say the board members are more guilty because the USOE and State Board has been representing to the governor and legislature that Common Core was a state-led effort when it actually seems you knew it was funded by the Gates Foundation. Sorry traveling today- Will get back to you later – But wanted you to consider all the changes in relationship to bringing thousands of students and teachers along on this journey of upgrading our standards and curriculum. Will answer your other questions later. Since I was accused of not knowing both sides of the story after sending my first email, and the reply I received was sent to all members of the State School Board, State Superintendent, and others, I feel compelled to share with you both sides of the conversation that followed my initial letter to the state school board (Part 1) so that you may have full disclosure on Common Core issues as viewed by the State Board. I wouldn’t want to be accused of not sharing both sides of the story with you since everyone on the school board now has my perspective. Debra forwarded your email to our Board, attempting to insure that we hear all sides of the issue on the Common Core Adoption. Since you and I have had several email conversations about the Mathematics Core over the years, I wanted to tell you how offensive this email is and why. First, each of us have our understanding of the facts, as they are presented to us and based on our experience. Our Board Chair, Debra, has a very unique view of the issues surrounding public education by the experiences she has been part of over the past nine years. She has represented our state at the national level and over the past three years, served as our Chair, with hundreds of meetings with legislators, educational groups, supporters and those who aren’t supporters. Her facts are based on a multitude of experiences that most of us, but especially someone outside the system cannot even imagine. She and other members of our Board have worked diligently to evaluate and reevaluate the structure, standards, assessment and all other contributing conditions to provide a quality education for the students of our state. She knows because of that involvement that part of the push back on the Utah Common Core, is the belief that all students cannot master the necessary skill to be successful. She also knows that mathematics professionals from another generation cannot fathom starting to teach algebraic and geometric ideas to Kindergarten students and having all students ready and proficient to pass Allegra and Geometry before they exit the school system. It is so sad that you could be so blind as to not understand that those working in the system might know something beyond what the public knows in regard to the workings of our school system, and part of that not knowing is the belief that all students can’t be ready for college. Your concerns over the state core curriculum over the years has had some basis. We have not had the highest quality of math and/or language arts standards to drive our curriculum over the many years we have had Core Standards. However, the adoption of the Common Core Standards have greatly improved our expectations and are now helping our districts and teachers upgrade the curriculum for each and every student of our state. These standards were created with the help of the brightest minds in our country (many from our own State Office of Education). And yes, developing such high quality standards does take money, and that issue is partly why Utah has always had to work and share with others educational professionals, or do without. As the lowest funded state in the nation, we have little extra money to put into developing standards, curriculum and assessment. Thus this collaboration is a huge advantage for our state, both in regard to the quality of the standards, but also the money saved in their creation. I have always valued your input, but am so sad that you would voice your input with such derogatory comments to someone who has worked so hard to help improve education for all the students of the state. Debra Roberts, our State Board and our State Office of Education deserves more from our constituents who care about education — because as a constituent, you are part of the success or failure of our system. Please continue to stay involved, but please take the time to stay informed in regard to the multitude of sides to any one issue. Dixie, I am a bit surprised at the tone of your letter to me. You tell me to know both sides of the story before commenting but did you know the things I listed in my letter to Debra? Did the state board know that this was not a state led initiative before you joined in to support it? Did anyone at the state office know that UNESCO and the Gates Foundation were the prime movers behind the Common Core? Did you know that Achieve is Gates funded? Were you fully aware of this agenda when the board signed onto Common Core? If you did, then I sincerely apologize (and this raises a host of new concerns). If not, I encourage you to learn the other side of the story. As you are probably aware, Debra’s comments came in the middle of a fight at the legislature to reconsider the Common Core standards in light of these discoveries. As you know, I and several others have been spoken ill of for our work. We’ve been called uninformed and worse. You make the point here that Debra was talking about some other people who think Common Core is too hard for our children. I’m not the judge on that, but I can say that I haven’t heard that from anyone except a teacher who deals with children every day who struggle to stay up on their math. Debra’s comment in the context of what was actually happening during the week, may have been a case of bad timing, since the ONLY people being discussed at the legislature or in the press were USOE officials who told legislators and the governor that this was completely a state led initiative, and parents like myself who were working hard to show this was the product of UNESCO and the Gates Foundation who have set us up and only needed states to come together on a common core to have the standards slip into place with everything else that was planned. Who reviewed Common Core? How did we determine it was better than our old standards? If we really want our children to be “career and college ready” why didn’t we go to one of the best standards available that would have still had significant curricula available for it? It would have been easy to adopt California or Massachusetts’ math standards since there are materials that match them and they are higher rated than Common Core. MA also has great English standards. Here’s a few comments you may find interesting in context of providing the other side of the story on Common Core. This excellent review shows specific examples where California is far easier to comprehend than the Common Core and is the source of these last two quotes. Last week the Salt Lake Tribune ran an article that had State School Board member Debra Roberts quoted as saying something I viewed as a direct attack on parents concerned about the Common Core implementation. I wrote this letter to her over the weekend and wanted to share it with the public since her comment was very public and needs a response. Yes it’s a pointed email. I do not like writing letters than have an element of venting but there is no more time to waste beating around the bush. I publish this here so that others can see the holes in the arguments being made by the education establishment. Use this and the materials we’ve published about the Common Core to get all the facts and have them at your disposal when public meetings occur. You don’t need to believe anything I’ve written about this. Do your own homework. We’ve listed references in our research but do your own reading and get up to speed on this. “I’m disappointed that there are a few in the state who don’t yet see the value of college and career-readiness standards for our students,” said Debra Roberts, state school board chairwoman. Now Common Core comes along and without the standards even being finalized, the board adopts them. No questions of Utah’s uniqueness at stake here. No questions about proving the quality of the standards against high achieving states or nations because THIS was the product of a state led effort so they must be excellent. I am outraged that you would make such baseless comments about people like myself. It is entirely inappropriate. What do you actually know about the origin of Common Core? Have you bought into the lie that this was simply the product of the NGA and CCSSO coming together to craft common standards? Have you done your own homework? Did you follow the money trail? Did you discover that this is simply a rehashing of the old “school-to-work” concept? Did you discover that the Gates Foundation paid the NGA and CCSSO millions of dollars to help in this effort? Did you find that the Gates Foundation paid the national PTA millions of dollars to shill for the Common Core and promote it into schools? Did you know the Gates Foundation signed a contract with UNESCO in 2004 to work with them and be in line with the UN’s agenda? Have you read any of it including this line? Did you listen to Larry Shumway on Rod Arquette’s show this week? He said he wrote his letter to Arne Duncan not out of concern for what myself and others were saying, but because he’s heard Arne and Pres. Obama talking about the standards as if they had made them. He’s finally seeing part of the net. They put the RTTT cheese out and we adopted their standards hoping against all common sense that they would send Utah somebody else’s money, but alas, we didn’t get any. Now we have contracts with strings. As you can tell, I’m frustrated and a large part of that is your insult to concerned parents all over the state who want the very best for their children and have very real concerns that the federal government is in takeover mode. I strongly encourage you to read these recent articles. The state board is soon going to become the administrative extension of the federal DOE. • 2012: States begin to recognize the loss of local control and enormous cost of implementation of the Common Core Standards. Many states begin pushing back. The Heritage Foundation and the Cato Institute call the standards unconstitutional per federal education law. Larry Shumway, Utah state superintendent, a member of the CCSSO Board of Directors, a member of the Board of Directors at West Ed which is the project management partner for SBAC assessments, recommends Utah retain its relationship as a governing member of the SBAC (thus forcing Utah to use their tests). This seems to me a clear conflict of interest for Mr. Shumway to testify to the Utah legislature on anything related to Common Core or the SBAC. Gates’ Foundation other contributions during the time frame of consideration and development of the Common Core initiative. To any who still harbor the illusion that Common Core State Standards were the product of the states simply coming together, I have a bridge in Brooklyn I’d like to sell you. Special thanks to the many people involved in digging this information up. Much work has been done by people all around the country to put this information together and help follow the money trail. Please do your part now in passing this information on to everyone you know so they can be educated about what the Common Core Initiative is really all about. To see where Common Core fits into the scheme of related programs that make up the globalization of education, check out this visual diagram and then other links below. 1. You push this agenda through individual “states” instead of “federal” because we like state’s rights. 2. You appeal to their desire for “higher standards” because we believe in an educated populace. 6. You hold national conferences to teach these ideas to state and local school boards and get them to buy into it. 7. You write the national standards, assessments and curriculum through gov’t partnered organizations so it doesn’t seem like the govt is writing them directly. 9. You advertise this as a Governor’s and State’s thing to the general public so no one looks behind the curtain. 10. You get as many Republicans and conservatives to accept your plan because of the nice sounding ideas, and they don’t realize they are setting up the foundation for a federal takeover of education. Families and conservatives don’t question these conservative legislators, but trust they are only after state’s rights and what is good for the children. Without realizing it, these good legislators have enacted laws to usher in this progressive agenda. 11. Get everyone to sign off on the standards as if there’s a crisis and this must be done right now. 12. Progressives never give up. When they don’t get their way, they just go back into their caves, re-strategize, change phraseology and try again. We ALWAYS have to be on guard for new tricks. 1. This whole idea was set up by the Federal Gov’t, USOE and dangerous national interests who are working together, like Bill Gates, Linda Darling-Hammond, Pearson, and large corporations set on making billions by partnering with the federal govt, states and local districts for a guaranteed income for years. These Public Private Partnerships threaten not only local control, but also real free enterprise for smaller businesses that have not been chosen by the govt for these contracts. What the Federal Gov’t cannot legally do, and visa versa, the other partner can accomplish. We have been tricked into thinking this is a locally grown program in Utah. 2. The next phase in this process is to develop Century 21 Community Schools which will invite more Public Private Partnerships (PPP). Big corporations contract with federal, state and local school entities to go into these community schools full time, 6-7 days a week, and provide services of free healthcare and dental, PreK-12 education, job placement programs, recreation, daycare, 3 meals a day and every service you can think of for the entire family. This has already started in Ogden School District and Ogden’s plan is to make every school in it’s district a full service community school. Arne Duncan speaks a lot about this plan and thousands of these schools are popping up all over the nation. All of this data (healthcare, psychiatry records, academic scores, meals, recreation, etc) will be a part of the state and national data base because these families go to a one-stop community center with every amenity they need. No need to go home or church or extended family. 3. Right now, we’re just talking about school records from Pre-K to college to work. That’s bad enough. But by setting up extensive data collecting technology, we are easily setting ourselves up for the next step of education when full-service 21st Century Schools will be the growing phenomenon. Please look beyond just Common Core, compare it with Obama’s National Education Goals, and look to see what these bills in Utah are setting up in the bigger scheme of things for the future. Simple, local and parent-centered are the answers. Everything is coming together for a total takeover of education by the Feds. This past week a bill at the Utah legislature was thankfully amended to drop a recognition of Common Core from the language, thus leaving things open without codifying Common Core into Utah law. Anyone who looks into Common Core can easily verify the power grab in education by the feds. And yes, homeschoolers are potentially at risk as the Homeschool Legal Defense Association pointed out last November. 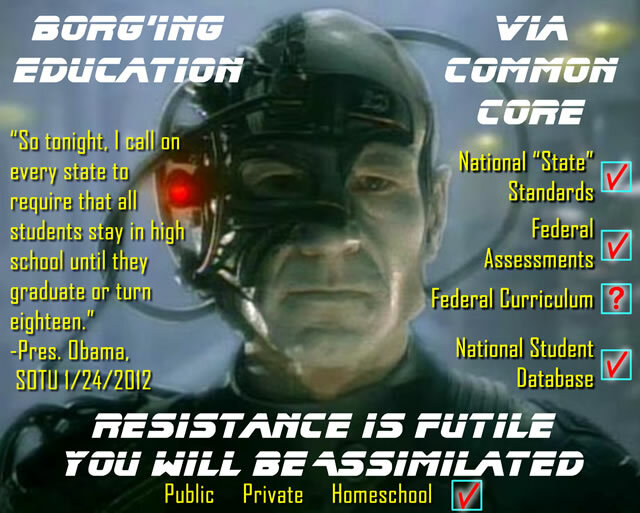 Here’s the Borg cube of connections which shows all the various organizations coming together to assimilate the education system. Even though the image above shows federal curriculum as unverified, the reality is that common standards and assessments will drive a perceived need for federal curriculum that matches the rest of the system. Pearson, the Gates Foundation, and others will be more than happy to provide new textbooks everyone is required to switch to.